You may have heard certain metals called noble metals. Here is a look at what the noble metals are, which metals are included and the properties of the noble metals. The noble metals are a subset of the metals, but the membership in the group is not well-defined. The strictest definition of a noble metal is metal with a filled electron d-band. According to this definition, gold, silver, and copper are noble metals. Another definition of a noble metal is one which resists oxidation and corrosion. This excludes copper, but adds in other platinum group metals, such as rhodium, palladium, ruthenium, osmium, and iridium. The opposite of a noble metal is a base metal. Noble metals are valued for use in jewelry, coinage, electronics, medicine, and chemistry as catalysts. The noble metals are a group of metals that resist oxidation and corrosion in moist air. The noble metals are not easily attacked by acids. They are the opposite of the base metals, which more readily oxidize and corrode. Which Metals Are Noble Metals? Sometimes mercury is listed as a noble metal. Other lists include rhenium as a noble metal. Strangely, not all corrosion-resistant metals are considered to be noble metals. For example, although titanium, niobium and tantalum are extremely corrosion-resistant, they are not noble metals. While acid resistance is a quality of noble metals, there are difference in how the elements are affected by acid attack. Platinum, gold, and mercury dissolve in the acid solution aqua regia, while iridium and silver do not. Palladium and silver dissolve in nitric acid. Niobium and tantalum resist all acids, including aqua regia. Calling a metal "noble" may also be used as an adjective to describe its chemical and galvanic activity. Under this definition, metals may be ranked according to whether they are more noble or more active. This galvanic series can be used to compare one metal with another for a particular application, typically within a set of conditions (such as pH). In this context, graphite (a form of carbon) is more noble than silver. The precious metals and the noble metals include many of the same elements, so some sources use the terms interchangeably. Chemistry allows for a loose definition of noble metals, but the physics definition is more restrictive. In physics, a noble metal is one which has filled electronic d-bands. According to this definition, only gold, silver and copper are noble metals. Platinum, Gold, Silver, and Palladium: This are bullion metals, used to make coins and jewelry. These elements are also used in medicine, particularly silver, which is antibacterial. Because they are excellent conductors, these metals may be used to make contacts and electrodes. Platinum is an excellent catalyst. 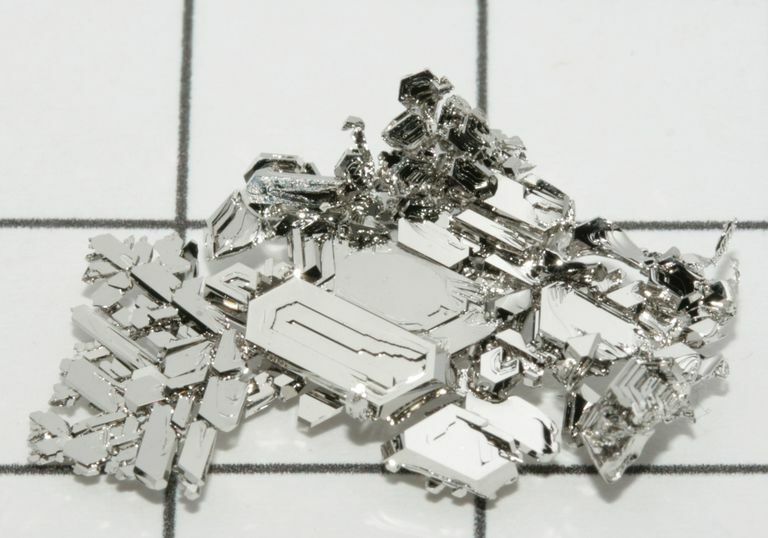 Palladium is used in dentistry, watches, spark plugs, surgical instruments, and as a catalyst. Rhodium: Rhodium may be electroplated over platinum, sterling silver, and white gold to add shine and protection. The metal is used as a catalyst in the automotive and chemical industries. It's an excellent electrical contact and can be used in neutron detectors. Ruthenium: Ruthenium is used to strengthen other alloys, particularly those involving other noble metals. It's used to make fountain pen tips, electrical contacts, and as a catalyst. Iridium: Iridium is used in many of the same ways as ruthenium, as both metals are hard. Iridium is used in spark plugs, electrodes, crucibles, and pen nibs. It's valued for making small machine parts and is an excellent catalyst. View the Chart of Noble and Precious Metals. Brooks, Robert R., ed. (1992). Noble Metals and Biological Systems: Their Role in Medicine, Mineral Exploration, and the Environment. Boca Raton, Fla.: CRC Press. "Dictionary of Mining, Mineral, and Related Terms", Compiled by the American Geological Institute, 2nd edition, 1997.